Is Ahmed Afif guilty by Association? In a stinging interview with the Today Newspaper this week, Honourable Ahmed Afif, member of the Finance and Public Accounts Committee (FPAC) of the National Assembly, gave the country a preview of the findings of an FPAC investigation in the Financial Intelligence Unit (FIU). He hinted that the findings look pretty serious. True to his words, a report of the investigation into alleged embezzlement of funds by high officials of the FIU, namely the Irish, submitted by Wavel Ramkalawan exposed flagrant violation of financial rules and abuse of powers by the Irish oligarch. While Afif vividly denounced those practices, he failed to mention that the FIU was created under his watch as PS of Ministry of Finance in June 2006 and a lot of the invoices or spending done without the appropriate invoices would have been recommended for approval by him, Mr. Ahmed Afif, the Accounts officer. Ahmed Afif claimed that no one dared question the practices of the Irish at that time and gave the impression that he was not aware of anything because FIU reported directly to the President. What Afif failed to tell us is that no money can be put in the consolidated fund without first being approved by the Minister of Finance on the recommendations of the Principal Secretary. So Mr. Afif must have been aware of that specific budget line that provoked the investigation. Why then did he not raise the alarm? Was he in any way benefiting from that? And why such a fuss now? And why only now after he had been given the boot by James Michel? Is it a case of sour grape! 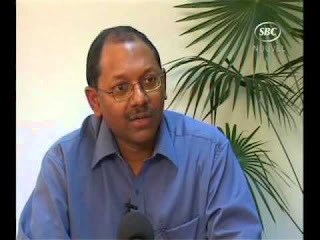 Even if FIU were initially a division under the Central Bank of Seychelles, Ahmed Afif as the Principal Secretary of Finance and the Deputy Chair of the Memorandum of Economic and Financial Policies Committee (MEFP), which regroups the Central Bank management and that of the Ministry of Finance, he would have become privy to those unusual spending. Again Ahmed Afif chose to remain silent. The million dollar question is why? It is, therefore, the pinnacle of hypocrisy for Ahmed Afif to wash his hands and distance himself from those illegal practices by the FIU when he himself was tacitly endorsing such practices. It is our humble opinion, that Ahmed Afif, as the Accounts Officer, should also face any criminal proceedings for the wrongful deeds that may have happened. Ahmed Afif is not above the law just because he is an LDS member of the National Assembly. We, therefore, call for his immediate resignation whilst he endeavours to steer clear of the mess that has now been labelled “the FIU debacle”.